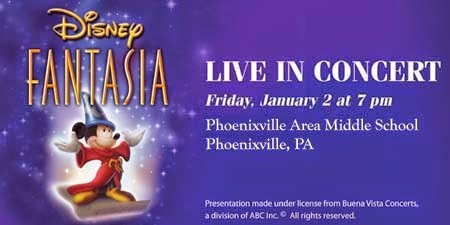 On Friday, January 2nd, the Pennsylvania Philharmonic will perform Disney Fantasia: Live in Concert at the Phoenixville Area Middle School. From bewitched broomsticks to flying horses, this iconic program taken from the original 1940 version and “Fantasia 2000,” includes Dukas’s The Sorcerer’s Apprentice, Beethoven’s Symphony No. 5, Beethoven's Symphony No. 6, Respighi's Pines of Rome, Stravinsky’s Firebird, Tchaikovsky’s “Nutcracker” Suite and much more, is performed live by The Pennsylvania Philharmonic’s 80-piece ensemble while Disney’s stunning footage is shown on a gigantic high-definition screen above the orchestra. For more information and to order tickets, go to http://paphilharmonic.org/fantasia_phoenixville.html or call 717-368-5143.